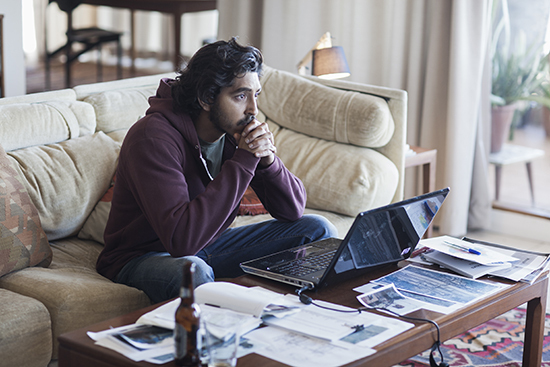 Based on the memoir by Saroo Brierley, Lion traces the trajectory of an extraordinary journey. A five-year-old boy, separated from his family, catches a train that doesn’t stop, and 1500 kilometres later he’s in Calcutta, adrift in a sea of commuters who can’t hear him and, if they do, can’t understand him. They mostly speak Bengali; he speaks Hindi. Lost in every sense, he has no option but to live on the streets, and makes do with the resourcefulness that small children have: surviving on gut-feeling to avoid harm, eating fruit offered to gods on the riverbank, running faster than the adults who steal away with the street kids when they’re asleep. First-time film director Garth Davis frames much of the Indian action from a child’s height, adult torsos and heads chopped off, decapitated, giving a true sense of the powerlessness felt by a child when he’s not listened to, when the stakes are impossibly high; he’s unable to even reach the ticket counter at Calcutta station. The adults sweep him away with a flick of their hands. Davies comes to the film having co-directed Jane Campion’s Top of the Lake (2013), deftly handling a horror story of Dickensian proportions as Saroo moves through Indian institutions where children are beaten and disappear into the night. He is eventually adopted by a Tasmanian couple, Sue and John Brierley (Nicole Kidman and David Wenham) and grows up in a caring home. But he can’t forget where he’s from, the deep bond with his mother and siblings. When helpful adults in India, searching in newspapers, ask him his mother’s name, he says, “Mama,” a loving word—so resonant with futility and loss. 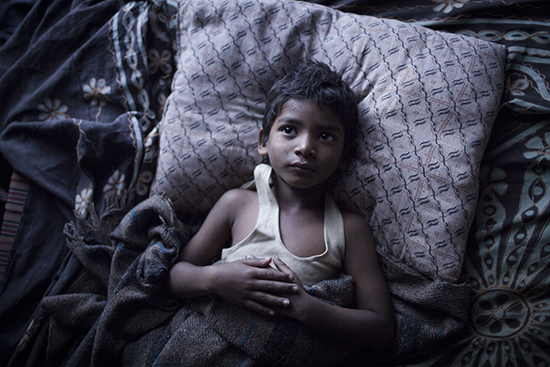 With no previous acting experience, Sunny Pawar’s performance is powerful and wrenches the heart. Chosen from 2,000 boys, at the beginning of the film shoot he speaks no English. Perhaps this helps him. After Saroo finds a large spoon in a deep pit of rubbish, a shiny treasure he hides in his clothing, he sits outside a café under a tree and pretends to eat with it, bringing the spoon slowly to his lips, copying a man sitting opposite in the café. This man sees the play and then sees the boy and how hungry he is. Luke Davies’ elegant script works well at conveying such scenes of exchange with few words spoken. Saroo’s story is a tale of the times. Played as an adult by Dev Patel, he sets out 25 years later on an impossible quest. To find his Indian family, he starts to search on Google Earth. He has a name (that he pronounces incorrectly and can’t find), an icon (a water tower he sees from the station) and a memory of the landscape that weaves around him as his small feet move, nimble, across it. He has a radius of about 1,500 kilometres from Calcutta. He clicks along each train track, looking at the layout of each station, searching for the water tower. It’s difficult in film to convey the grinding boredom of this search, the obsessive-compulsive nature of the slow click, that keeps Saroo in lockdown in his room for years, losing a girlfriend, Lucy (the luminous Rooney Mara), and family in the process. But it’s a mark too of the resilience of a small boy, now fully grown. Hollywood film is always drawn to the fast pace of technological advances, the forensics, the nabbing of a criminal. Here, the film has to rely on the low-tech and stagnate for a while, and Patel goes for a sense of Saroo slowly breaking down, mind-numbed and exhausted by all-night searching, wandering malls, lost again among the familiar this time, snaps of memory filtering through. It’s the physical presence of objects that brings the past back to help him, sense-memories: the smell of the bright Saffron-red jalebi, a sticky sweet in his friend’s kitchen, and the weight of rocks that he helped his mother carry as she worked.Sometimes a story is so personal that as a viewer it’s impossible to stay outside it. My brother was adopted from Bangladesh when I was five years old. I met him at the airport: a six-month old, bundled in white, carried by my mother. He came with a doll and a name printed out, “Sony.” But the pronunciation (as with ‘Saroo’) was different, and so my parents changed it to be more like the name they heard; he avoided the branding. Like Saroo, he arrived with a story lost to us. Nicole Kidman was drawn to the role because she has also adopted children and the Brierleys are portrayed as caring, loving people whose desire is to help children without other means of support. The ethics of international adoption are left alone—although Saroo’s adopted brother, Mantosh, battling addiction and depression in Tasmania, is a counterpoint to any seductive happy-families reduction. In the cinema, my mother and I do our best to keep ourselves together as we watch the film with my son. The memory mapping forces me to go back and recall my own tracks as a five-year-old, the year my brother arrived, no adults in sight, the steps to school, the round-the-block dawdle, the large trees you could climb as markers, the sounds of cars hooning around Mt Panorama, the cut through the neighbour’s backyard to a friend’s on the other side where a swing set beckoned. I think of my own son, how he flits between the virtual and actual worlds, Google Earth and the ground between his feet. His parents wait at the school gates. The GPS talks to him in the car, mispronouncing streets and towns, giving him polite directions. His parents walk him, holding hands, across the street. Always holding hands. What paths has he forged on his own? What paths will he remember? And as I hold my son’s hand tight on the train home from the cinema, I wonder if he will really need to remember at all? Perhaps it’s a notion that will pass him by—this idea of getting lost.